Also serving communities of Harvey. There are 28 Assisted Living Facilities in the Marrero area, with 2 in Marrero and 26 nearby. The average cost of assisted living in Marrero is $3,500 per month. This is higher than the national median of $3,346. Cheaper nearby regions include New Orleans with an average starting cost of $2,400. To help you with your search, browse the 93 reviews below for assisted living facilities in Marrero. On average, consumers rate assisted living in Marrero 4.0 out of 5 stars. Better rated regions include New Orleans with an average rating of 4.4 out of 5 stars. Caring.com has helped thousands of families find high-quality senior care. To speak with one of our Family Advisors about assisted living options and costs in Marrero, call (855) 863-8283. Marrero, Louisiana is a small city of about 33,000 residents located in the New Orleans metropolitan area. The marshland and swamps of Barataria Preserve in Marrero provide active seniors with an abundance of natural beauty, while the close proximity to New Orleans offers opportunities for participation in the vibrant cultural life of south Louisiana. Approximately 15.9 percent of the population is age 65 or older, and there are 28 assisted living facilities in the area, including two within city limits, to cater to this population. As throughout Louisiana, assisted living communities in Marrero are licensed as Adult Residential Care Providers (ARCPs) by the Louisiana Department of Health and divided into four levels based on how many residents live there, the type of accommodations and the specific care provided. Marrero is home to world-class medical facilities, including West Jefferson Medical Center in the event of medical emergencies or illness. The city of Marrero offers local seniors an array of arts and culture options, including access to local festivals, proximity to world-class museums in the nearby city of New Orleans and an assortment of professional and community theater, musical, sports and dance performances throughout the year. Marrero has an array of community resources for seniors, including the Jefferson Council on Aging, an organization that organizes educational programs and offers assistance to local seniors as well as operating senior centers throughout Jefferson Parish, including one in Marrero. Marrero has a warm subtropical climate, with mild winters and hot, humid summers. An average of 223 sunny days per year and a comfort index of 72 on a 100-point scale ensure that active seniors can partake in outdoor activities throughout the year. Families may want to ask assisted living facilities under consideration what plans are in place to protect residents from excess summer heat and hurricanes that might threaten the region. Crime rates in Marrero are higher than the national average, so assisted living facilities in the region should have security plans in place to protect senior residents from crime. Marrero seniors in an assisted living facility may stretch their budgets further with favorable tax rates from the state. Louisiana doesn't tax public pensions or social security at all and offers tax breaks on many other forms of retirement income, including IRAs and private pensions. Assisted Living costs in Marrero start around $3,500 per month on average, while the nationwide average cost of assisted living is $4,000 per month, according to the latest figures from Genworth’s Cost of Care Survey. It’s important to note that assisted living rates in Marrero and the surrounding suburbs can vary widely based on factors such as location, the level of care needed, apartment size and the types of amenities offered at each community. 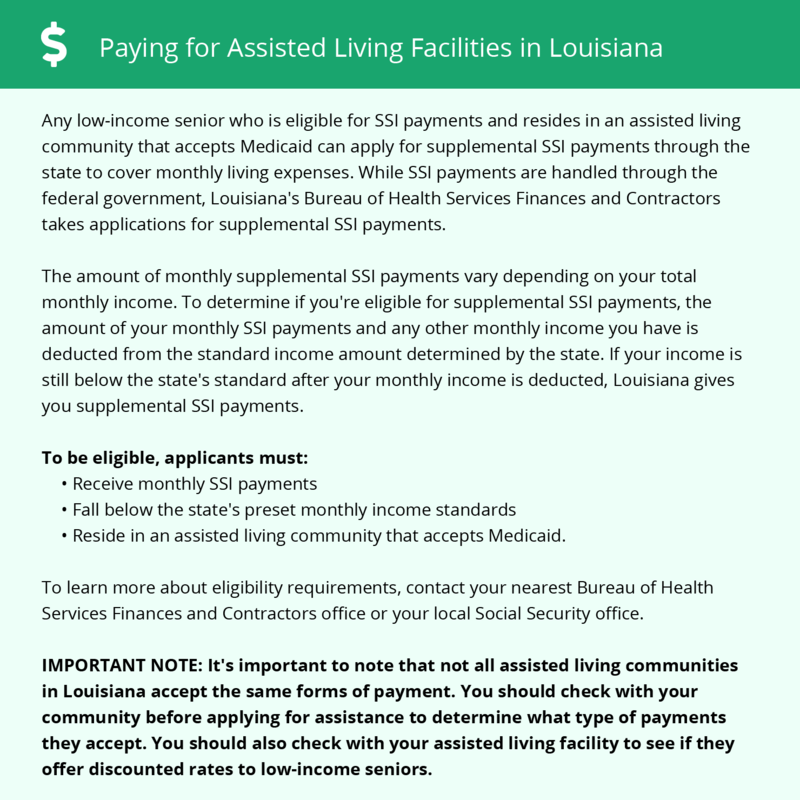 Eligible seniors living in an ARCP in Marrero might be able to get financial aid through the Louisiana Medicaid Long-Term Care Services program. Marrero and the surrounding area are home to numerous government agencies and non-profit organizations offering help for seniors searching for or currently residing in an assisted living community. These organizations can also provide assistance in a number of other eldercare services such as geriatric care management, elder law advice, estate planning, finding home care and health and wellness programs. To see a list of free assisted living resources in Marrero, please visit our Assisted Living in Louisiana page. Marrero-area assisted living communities must adhere to the comprehensive set of state laws and regulations that all assisted living communities in Louisiana are required to follow. Visit our Assisted Living in Louisiana page for more information about these laws.